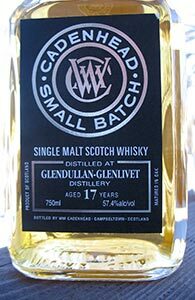 The venerable independent bottler Cadenhead’s is back in the US. Let there be rejoicing. There’s been a general revamp at Cadenhead’s with a new boss and new packaging. I don’t have anything interesting to say about the former, and I am agnostic on the latter. I quite liked the old, green bottles from when Cadenhead’s were last in the US and don’t mind the new dumpy bottles. I wouldn’t be me if I didn’t complain about something though so I will say that I wish that the distillation years were on the labels and not on the little thingamajig on a string around the neck (is there a name for that thing?). In stores where these bottles are kept behind glass it’s annoying to have to call someone over just to find out what years particular bottles are from. But this is a minor issue.